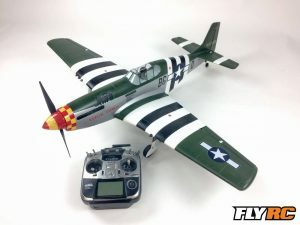 The only things needed to get the P-51B Mustang into the air is a 4-Channel radio with receiver and a 3S 2200mAh LiPo battery. WING LOADING: 15.3 oz./sq. ft.
It’s hard to not love the iconic P-51 Mustang. Yes, we know there are many Mustangs out there, but that’s because people truly love this thoroughbred fighter. 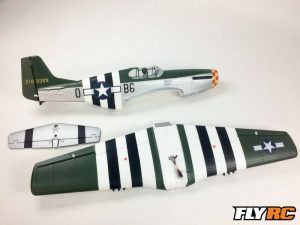 We’ve all seen the P-51D done time and time again, but I’m a real fan of the Razorback styled warbirds and when I saw that Tower Hobbies was releasing a P-51B model, I knew I had to have one. Then when I found out it had the option for retracts and flaps the deal was sealed and I placed my order. The Mustang came well packed with all the parts in separate bags that were taped to keep things from shuffling in shipping. I also ordered the electric retract option as well as making sure I had a couple extra servos for the flaps. The build was very easy. 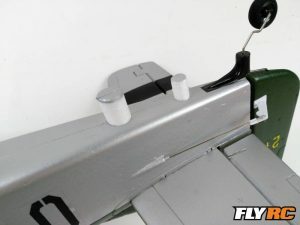 The retracts dropped right into the existing wheel mounting slots and a channel was pre-cut for the servo wires to route to the middle of the wing. The flaps were cut free and the servo bay outline was molded into the foam so it was easy to cut it out and drop the flap servos in place. The horizontal stab is held in place by some foam plugs that both align and lock it in so it cannot move. The wing simply bolts on from the inside of the fuse and with all the servo leads routed to the middle. I dropped in a Futaba R617FS receiver so it was out of the way of the battery. 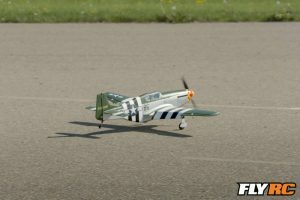 The Tower Hobbies P-51B has plenty of room in the battery bay for adjusting the CG for varying packs. 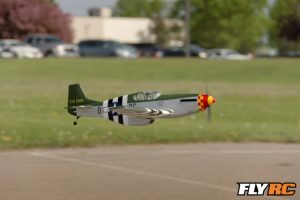 We tried a few different 3S 2200 batteries on the stock prop and had no problem balancing the Mustang with any of them. A quick setup of the rates using the recommendations in the manual and it was ready to fly. The fields I usually fly at have smooth runways so I was able to do a rolling take off from the runway. The steerable tailwheel gave decent control on the ground. If there is a breeze it is likely to fight it and wants to weathervane as there is not much weight keeping this plane on the ground. The main wheels are close to the CG so the plane does have a tendency to want to nose over. Judicious use of the elevator while taxiing and on the take off roll will counter this or a few shims to the rear of the gear mounts would help push the main wheels forward a bit to help. If flying from anything other than a smooth runway it would be best to leave the landing gear off and just hand launch the Mustang. In the air, this Mustang is a real treat. The stock power system on 3S is well suited and pulls the plane with authority. It does not feel like a sluggish model at all and the controls are quite nimble. Large loops from level flight are easy and the plane rolls like it’s on a rail. Kick in a little rudder and you can go knife edge for a nice photo pass. Inverted flight is no issue either and when balanced correctly, requires just a little forward pressure on the elevator. I found myself making figure eight strafing runs down the X pattern of our field. Feel free to insert your own gun sounds if you do this. I won’t judge you! The plane is a thoroughbred fighter and is meant for speed, but it does surprisingly well with the throttle pulled back. For those wondering, a ball field would be perfect for this plane and you would not feel boxed in. 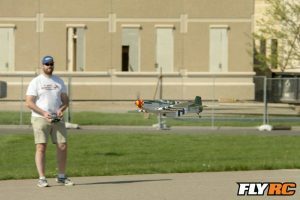 I took the Berlin Express up on a day with more wind to see how it would fly. In the air at speed, it’s happy as it can be. It still penetrates forward and does not bobble around too much. When slowing down for landing a gust would bump it around a little, but quick corrections on the stick and it still made it back to the runway and landed just fine. The flaps are a nice addition, but not really needed on the stock setup. When flying in wind I’d leave them up altogether. If you do have a runway to fly from, it’s hard not to add in the optional retracts. Being able to take off and tuck the gear away then make a high-speed low pass is just too fun! Then being able to drop the gear back down and grease in a landing just helps to complete the experience. For me it’s hard not to fall in love with a razorback warbird from WWII. 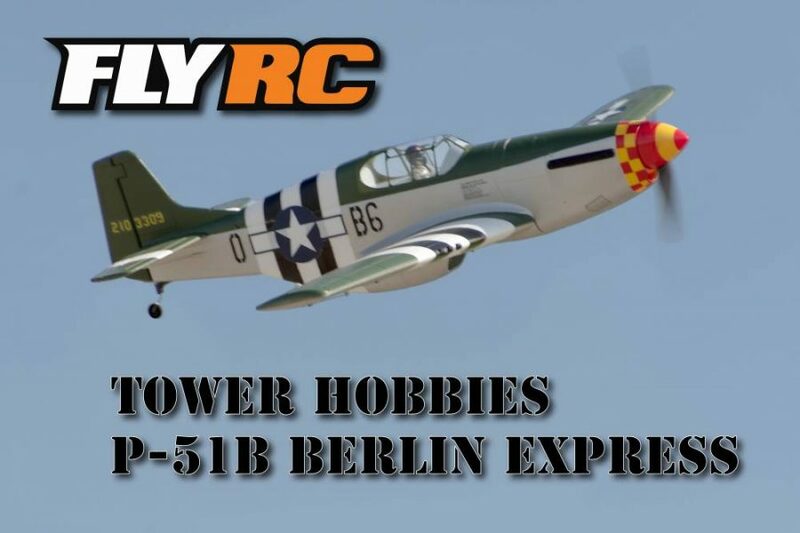 I’m loving the Tower Hobbies P-51B Berlin Express model. It’s the perfect grab and go flyer for spur of the moment flight opportunities. Just about everyone who flies electric airplanes has a few 3s 2200 LiPo batteries laying around. Throw in a spare 4 or 6 channel park flyer receiver and you’re off up into the air. 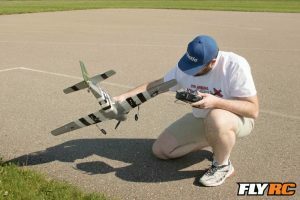 If you have a smooth runway then grab the retract upgrade and throw in a couple servos for the complete package. For how little you’ll spend to purchase this and the very little time it takes to assemble, you’ll have hours of fun with this Mustang.